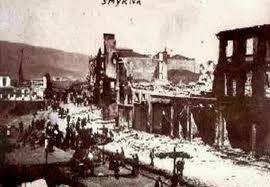 No one knows who burned the city (Ataturk gave orders that on pain of death no civilians were to be harmed). Hemmed in by fire and the Turkish army, Christians huddled on the pier. Old men died alongside women giving birth. In Our Time, Hemingway's first story collection, begins with these images, gleaned from refugees a scant three weeks later by the young American journalist for the Toronto Star. 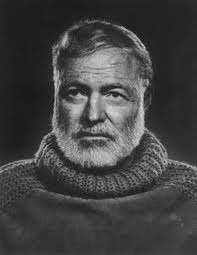 Toward the end of September, Hemingway, a new arrival on the Paris literary scene, boarded a train to write about a war. As he crawled through the Balkans on the Orient Express, bound for, as he put it, "Constantinople and Scutari (Üsküdar), where a short bronze-faced, blond Turk with a seasoned army of 300,000 men and a united nation at his back dictates terms to the Allies," the situation had reached a critical mass. Like a prize fighter who has floored his opponent and glares about for the next challenger, Turkish forces marched into the neutral zone decreed by the Treaty of Sevres. They were ordered by British General Harrington to desist. Mustafa Kemal refused-the British were in no position to give orders. 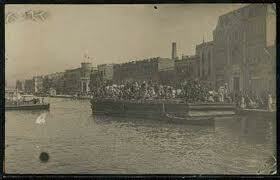 The Italians and French armies fled and the Greek navy was ordered by the British to quit Istanbul. In a city where people remembered only too well what happened in Izmir everyone was on knife's edge as Ataturk met with the allies to discuss peace terms. It was into this pressurized environment that Hemingway arrived. "Constantinople doesn't look like the movies. It does not look like the pictures, or the paintings, or anything. First your train comes winding like a snake down the sun-baked, tree-less, rolling plain to the sea. It rocks along the shore where kids are bathing and out across the blue water you see a big brown island and faintly beyond it bulks the brown coast of Asia." From his arrival at Sirkeci to his procession across Galata Bridge, up the hill to the Buyuk Londres Hotel in Pera, Hemingway describes a brownish city of narrow streets, bad traffic and hillsides strewn with rubbish. Although a first time visitor, Hemingway adeptly conveyed Istanbul to his readers in a few compact brush strokes. "You get flashes of squatting, mushroom-like mosques always with their dirty white minarets rising from the corners. Everything white in Constantinople is dirty white." Its hard not to marvel that he was only 23. He hadn't a single novel to his credit and had only published a handful of stories. However his experiences in World War I had already given his work its characteristic detachment. Most importantly, Hemingway had developed a knack for thrusting himself into the action. "There is a tight-drawn, electric tension in Constantinople such as only people who live in a city that has never been invaded can imagine. Take the tension that comes when the pitcher steps into the box before the packed stands at the first game of the world series, multiply it by the tension that comes when the barrier snaps up, the gong clangs and they're off at the King's Plate at the Woodbine (Toronto racetrack), add to it the tension in your mind when walk the floor downstairs as you wait frightened and cold from someone you love while a doctor and a nurse are doing something in a room above you that you cannot help in any way..." Probably more hyperbolic than his masterworks, at the same time, however, Hemingway was writing as a journalist and thus, we get to see a different side-one concerned with deadlines and sensationalism. Not that hyperbole was really necessary that autumn. 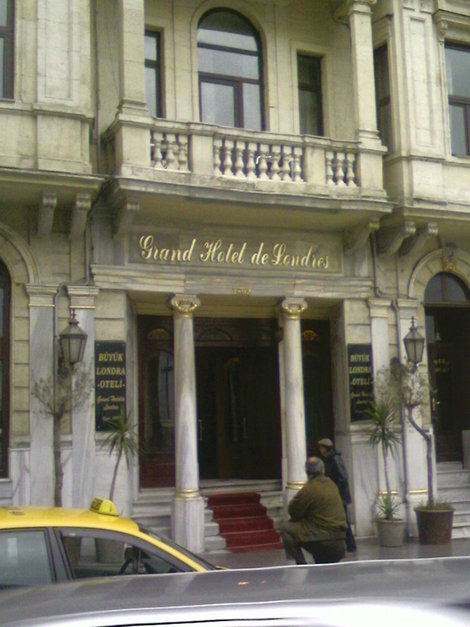 Hemingway entered a city that did not know whether it would witness a second Izmir should the allies abandon the straits. The "upstairs operation" is an allusion to the Mudanya conference where Ataturk sat down with the allies to decide Istanbul's future. In an interview with Ataturk's representative in the city, Hamid Bey, Hemingway discusses the prospect of sectarian strife. "Canada is anxious about the possibility of a massacre of Christians when Kemal enters Constantinople," I said. "What have the Christians to fear?" he asked. "They are armed and the Turks have been disarmed. There will be no massacre. It is the Greek Christians who are massacring the Turks now in Thrace. That's why we must occupy Thrace to protect our people." The settlement of eastern Thrace and the freedom of the straits were at issue in Mudanya but the press weren't invited. While awaiting the outcome of the conference, Hemingway had plenty of time to take in Istanbul. 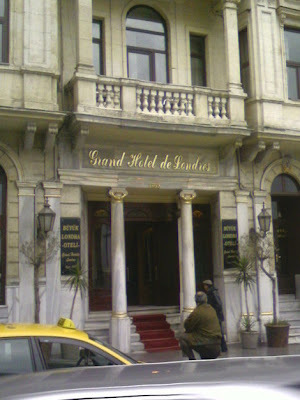 The Buyuk Londres Hotel in Pera, where he stayed, was one of the grand pensions built during the 1890's in anticipation of the Orient Express. Today it epitomizes 19th century European opulence; in the grotto-like bar one can imagine Hemingway going over proofs whilst smoking cigarettes and sipping martinis. From the Londres front steps looking out over the Golden Horn, you can imagine how he saw the city each day. "In the morning when you wake and see a mist over the Golden Horn with the minarets rising out of it slim and clean toward the sun and the muezzin calling the faithful to prayer in a voice that soars and dips like an aria from a Russian Opera, you have the magic of the East. When you look from the window into the mirror and discover your face is covered with a mass of minute red speckles from the latest insect that discovered you last night, you have the East." All of Hemingway's dispatches display the same ambivalence toward the city. In describing Turkish cuisine the author comments how "the fish are good" and yet in the same paragraph how his jaw muscles were beginning to "bulge like a bull dog" from eating tough Turkish beef. Hemingway's October 28th, 1922 article, "Old Constan," makes many observations that any modern Istanbullu can relate to. About the weather he quips, "If it doesn't rain in Constan the dust is so thick that a dog trotting along the road that parallels the Pera Hillside kicks up a puff like a bullet striking every times his paws hit the ground...If it rains, this is all mud." His descriptions of Beyoglu are priceless, "All night hot sausage, fried potato and roast chestnut stands run their charcoal braziers on the sidewalk to cater to the long lines of cabmen who stay up all night to solicit fares from the revelers." His take on late night Beyoglu is eerily familiar, "Before the sun rises in the morning you can walk through the black, smooth-worn streets of Constan and rats will scuttle out of your way, a few stray dogs nose at the garbage in the gutters, and a bar of light comes through the rack in a shutter letting our a streak of light and the sound of drunken laughing. That drunken laughing is the contrast to the muezzin's beautiful, minor, soaring, swaying call to prayer and the black slippery, smelly, offal-strewn streets of Constantinople in the early morning are the reality of the Magic of the East." Hemingway was in Istanbul long enough to conduct a few interviews, complain about a particularly officious Near East censor and describe his Greek landlord, who had armed himself to the teeth to defend his hotel in the event of rioting. The Mudanya conference, of course, would turn out to be a diplomatic triumph for Ataturk, who was gracious in victory. The Greeks were given time to peacefully withdraw beyond the Maritza River (the present-day border of Turkey) while the Turks waited patiently to take possession of their territory. Hemingway moved on to Edirne to take in the Greek departure from Eastern Thrace. Once again witness to one of the many seismic movements that would mark a turbulent century (a movement reenacted by the Turks in Greece who were forcibly relocated to Anatolia), Hemingway pulled no punches. "The main column crossing the Martiza River at Adrianople (Edirne) is twenty miles long. Twenty miles of carts drawn by cows, bullocks and muddy-flanked water buffalo, with exhausted, staggering men, women and children, blankets over their heads, walking blindly along in the rain beside their worldly goods." Though Hemingway was in Turkey less than a month, his time here served as an important education in war correspondence. Throughout his career, Hemingway would recreate images of conflict in sharp declarative sentences. His World War I career led to Farewell to Arms; his time in the Spanish Civil War yielded For Whom the Bell Tolls. It was in Turkey, however, that Hemingway really cut his teeth. As for the man himself; he returned to his wife in Paris with a face criss-crossed by insect bites and a head so lousy from sleeping in a Thracian boarding house that he had to shave off his hair.